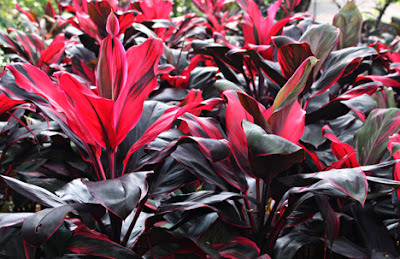 Cordyline are common ornamental plants that make excellent houseplants. Genus name comes from the Greek word kordyle meaning a club. The Stem Usually flowers and fruits as a shrub 2-3 m tall, occasionally to 5 m tall. Leaf blades reddish, about 25-80 x 5-12 cm, petioles about 8-20 cm long, grooved on the upper surface. Base of the petiole clasping the stem and leaving a ring-like scar when shed. Panicles about 20-40 cm long, flowers sessile or pedicels up to 2 mm long. Sepals and petals of similar size, glabrous, about 9-12 mm long. Anther filaments about 7 x 1 mm, white, winged, tapering to the apex. Anthers cream, about 3.5-4 mm long. Ovary about 2.5 mm long. Style and stigma about 7-8 mm long. Ovary and stigma white. Ti plant produce fruit with size about 1 cm diam. Cordyline fruticosa, commonly called Ti plant, typically grows as a short tree or shrub to 10’ tall in its native habitat of tropical Southeast Asia, eastern Australia and some Pacific islands including Hawaii. In the United States, it can only be grown outdoors in far southern Florida, southwestern United States and Hawaii. This is a long-lived broadleaf evergreen that features thin lance shaped leaves (to 30” long and 6” wide) that emerge pinkish red, but mature to deep green. Scented, white to pale lavender flowers appear in panicles (to 12” long) in summer and are followed by red berries. Houseplants rarely flower and fruit, however. As the plant ages, it loses its lower leaves. Leaves of this plant have been used in Hawaii to make hula skirts and edible rhizomes for food. Varieties in commerce include plants with colored or variegated foliage. Synonymous with C. terminalis. Best media for Cordyline is a well-drained, peaty potting mixture. This plant need bright indirect light, but it can tolerate light shade. Avoid direct sun light. You needs consistently keep soils moisturized from spring to fall. Does not require winter dormancy, but appreciates a resting period with reduced watering from fall to late winter. Cordylines are one plant group that really compliment the palms and like the low light conditions. Ti plant can be relatively easy to grow indoors as long as its high humidity needs can be met. Consider growing in humidified rooms, place pot on a bed of wet pebbles or grow in bathrooms. Regular temperatures in summer and minimum 65F in winter. Plants may be grown from stem sections, commercially referred to as Ti logs, by placing the same on a bed of moist gravel until roots appear. For outdoors, Cordyline can act as a border to direct foot traffic through the landscape.